If you feel like a rich, indulgent dessert you have to try this recipe. The pudding has a thick mousse-like consistency and is filled with healthy fats from the coconut and avocado, and sweetened with natural honey and dates. You might find it hard to believe that this dessert isn’t bad for you. Dates are a great way to add sweetness to a dessert. Their syrupy flavours taste like rich, gooey caramel (minus all the fat!). Avocado lends itself to recipes like this. 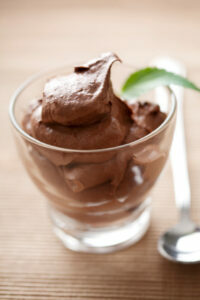 The creamy flesh gives the pudding its mousse-like smoothness. Coconut milk is great in place of cream as it contains good-for-you fats that can keep you full and satisfied. 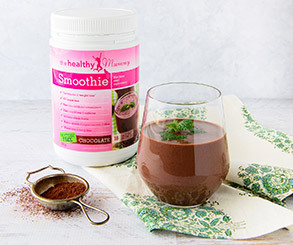 Try to find cacao if you can (most health food shops have it), or you can use any good quality (unsweetened) cocoa powder. Place the dates and the water into your blender and allow them to soak for 30 minutes to become soft. Add in all of the other ingredients and blend until very smooth and creamy. Depending on your blender, you may need to add a little extra coconut milk or water to get the right consistency. Pour into small bowls and serve as pudding – or you could even pour into ice block molds and freeze overnight to serve them as ice creams. When frozen it looks just like chocolate ice cream. The kids won’t know it’s healthy! Serves: 6. Calories per serve: 245.